World Heritage Cities, cities of international tourist interest, emblematic monuments... you can get closer to all this and more for little money: with our AVE tickets. Read our advises about AVE tickets Antequera Barcelona and in this way you will get all the information so that your travel by AVE Antequera - Barcelona becomes a unique experience... and affordable for all budgets! In the AVE you can even travel with your baby buggy if you fold it up. 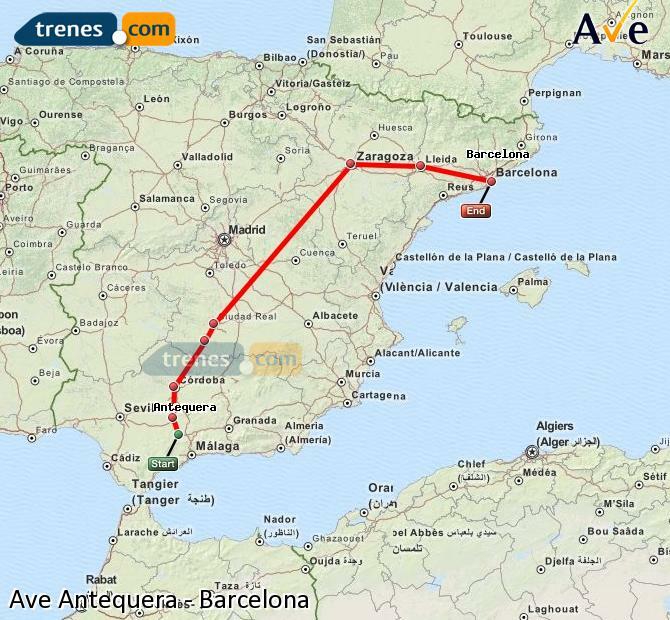 Check the timetables for AVE from Antequera to Barcelona on, AVE schedules Antequera to Barcelona. Since a travel by AVE Antequera - Barcelona is always synonymous of tranquillity and comfort without any concern, why should we not also try to obtain AVE tickets from Antequera to Barcelona cheaper? Because you deserve the best of travel, do not leave without your AVE rickets Antequera Barcelona. Equally, for the return, AVE Barcelona Antequera. If we book tickets for AVE Antequera Barcelona in Turista class and for the ida, we will be in front of the cheapest price we can offer for these tickets AVE Antequera Barcelona or we will be very near of the cheapest tickets for AVE Antequera - Barcelona, being this super cheap price of 35,30 €. Get to know new cities travelling by AVE. The search for the AVE train ticket from Antequera to Barcelona for the best price was made on the 01/04/2019 a las 17:07 h, it is a AVE train with departure on the 02/04/2019 a las 8:58 h and arrival on the 02/04/2019 a las 14:25 h. The price of the cheapest ticket has been 35,30 € and the cheapest rate possible for this ticket has been the Promo fare. Trenes.com issues official AVE Antequera Barcelona tickets and it does totally legally as a verified and authorised travel agency by Renfe, ie if you buy a AVE Antequera Barcelona ticket through our website, you only need to print the ticket or to show the bidi code sent to the mobile phone, present it at the Antequera Santa Ana station and get on the train you have got assigned. This is a real example of a Antequera Barcelona ticket issued by Trenes.com. On it you can see the ticket number 7123200625739, the locator CX9GZE, the origin and destination stations, in this case the train travels from Antequera Santa Ana to Barcelona Sants. The railway operator Renfe, the train type AVE, the train number 03995 and the rail car 005. The contracted rate Promo in Turista class, the assigned seat 06B, the price for the ticket, this Antequera Barcelona train ticket is not necessarily the cheapest ticket since the price of the train ticket often depends on the time in advance with which you bought the ticket. In this case the price is 46,60€ and the departure date is 21/03/2016. The train departure time of this ticket is at 15:57 h and the arrival of this train at the Barcelona Sants station is at 21:15 h. The duration of the journey from Antequera Santa Ana to Barcelona Sants has been 5 horas 18 minutos. By contrast, booking tickets for AVE Antequera - Barcelona in Preferente class and for ida will get closer to the highest price we are going to offer you on Trenes.com for your AVE tickets Antequera Barcelona. Such price is of 198,20 €, which, as you shall see, it is also cheap, because our passion is offering travellers the best and cheapest tickets for AVE Antequera Barcelona. The average price is normally around 83,69 €, if you are familiar with the prices for tickets for AVE Antequera Barcelona you will verify that we offer our travellers the cheapest tickets for AVE Antequera Barcelona, thanks to a quick and very simple search engine for the best prices of tickets AVE. You can not be late for a meeting? Do you want to make the most of your stay in Barcelona? Travel by AVE to Barcelona. The time of the day in which the tickets AVE Antequera Barcelona will be cheaper to start your travel by AVE to Barcelona is in the evening, and if it suits the planning for your travel Antequera - Barcelona, start your travel booking tickets for AVE Antequera Barcelona which depart at 15:00 h, reaching Barcelona at 20:22 h punctually and saving money with the price of your tickets for AVE Antequera Barcelona. You will see important discounts on the price of your tickets AVE Antequera Barcelona on Trenes.com. We offer the tickets for AVE Antequera Barcelona so cheap, that maybe you also want to know how to reduce travelling time, in this case, the best option is booking the tickets for AVE Antequera - Barcelona that depart from Antequera Santa Ana at 15:57 h, because we will do our travel in roughly 5 hours 18 minutes. We work every day so that travellers can get their AVE Antequera - Barcelona still cheaper. Visit one of the most popular Spanish cities of the moment by AVE from Antequera. Get on the train in Antequera Santa Ana, look for the seat that has been assigned to you and enjoy the trip doing something you like. The AVE is a prompt and quiet means of transportation, where you can read, listen to music, use your laptop or just relax or have a coffee in the AVE cafeteria. 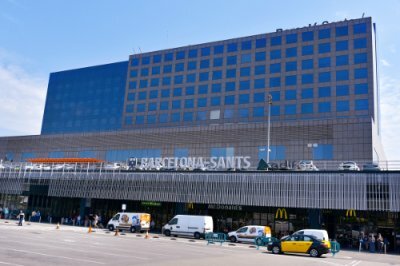 After 5 hours and a half you will arrive at Barcelona Sants Estació, the main station in Barcelona and from where you can go to the place you need, because it is fully well connected to all corners of this city. The station of Sants consists of a floor at street level where all the services and shops are and an underground level where all the ways are found. The station is located in Plaça Dels Països Catalans and it provides all possible rail services: high-speed trains, long and medium-distance trains and suburban trains. Outside, there is a bus station, urban bus stops and taxi rank. On the outside, you will also find tourist attractions that are worth visiting. The Park of España Industrial is right next door. If you have time for a walk, you can spend a good time there. 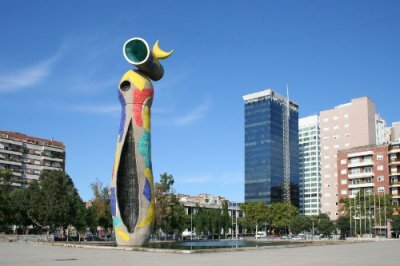 You can also go to the park called Joan Miró, where you can relax in a green area and at the same time, see the sculpture Dona i Ocell of this artist, Joan Miró.